Peter Nehlsen will give a pre-concert talk on Feb. 9 about the double-keyboard piano that he created. Shepherd of the Bay Lutheran Church will host three Peninsula Music Festival (PMF) February Fest concerts on Feb. 9, 16 and 23. Performances begin at 2 pm. 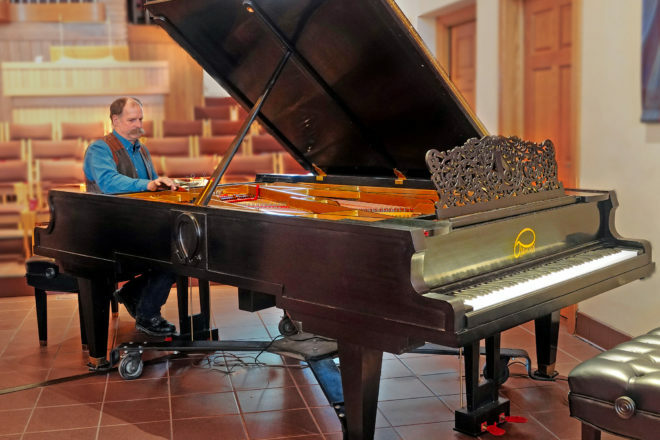 The Feb. 9 event features pianists Andrew Armstrong and Inna Faliks, who will showcase their talents on the unique “Omega Double” piano created by Washington Island craftsman, furniture maker and highly sought-after piano tuner Peter Nehlsen. He will present a pre-concert talk on the construction of the double-keyboard instrument at 1:15 pm. Armstrong has played to audiences from New York’s Carnegie Hall to the Moscow Conservancy, with such prominent conductors as Itzhak Perlman and Stanislaw Skrowaczewski, to name a few. 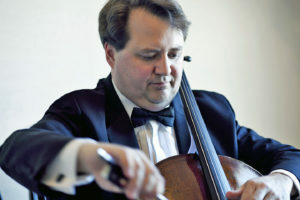 He has appeared in chamber-music concerts with the American Manhattan String Quartet, Caramoor Virtuosi, Boston Chamber Music Society and Seattle Chamber Music Society. Hailed internationally as a “concert pianist of the highest order,” Ukranian-born Faliks has appeared with Victor Yampolsky, Dmitry Sitkovetsky and a wide range of other acclaimed conductors. The Feb. 16 concert program brings two PMF Orchestra trumpet players together on the same bill. Bruce Briney and Dan Grantham will perform with pianist Judith Jackson and organist Greg Beem. Under Briney’s accomplished leadership both as a conductor and teacher, his students have been frequent winners in national U.S. competitions. Briney has performed at concerts and conferences throughout the Midwest. Grantham, also an active teacher, is a soloist and chamber musician, and he has been a prize winner in six major competitions. Jackson currently makes Door County her home, and she shares her experiences locally as a professional pianist and vocal coach to Cyndy Stiehl, among other well-known vocalists. Jackson serves as the principal pianist, and Beem the principal organist, for Shepherd of the Bay Lutheran Church. To reserve tickets, call 920.854.4060. General admission is $25 for a single event or $60 for the series. Tickets for students and children are $5. For more information, visit musicfestival.com.